Now available from Bird Gard is the solar snake repeller; a non intrusive, cost effective and environmentally friendly method of getting rid of snakes. The snake repeller is suitable for use with both poisonous and non-poisonous snakes. It works through the creation of pulsing vibration waves through the ground. The waves created by the solar snake repellers work to effectively repel snakes within a diameter of up to a 30 metres. The pulsing vibration waves created by the snake repeller simulates danger to a snakes that they sense through their bodies. On sensing the pulsing vibrations snakes will become irritated and depart the location. The solar snake repellers are easy to install. They work to repel snakes 24/7, operated, without the need fro chemicals, by a sealed solar power unit. The snake repellers are environmentally friendly and pose no danger to humans, livestock and pets. 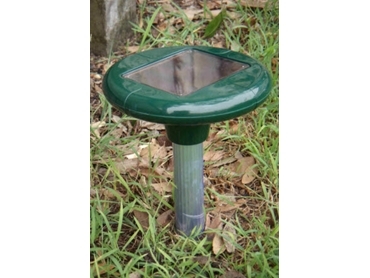 The solar power snake repellers are installed by driving the aluminium pole directly into the land, leaving only the discreet and sturdy green solar panel visible. Bird Gard recommends installing 2 of the snake repellers 25 metres apart for the most effective solution.